My Slimming World Journey - Week One. A couple of weeks ago, I was sorting out my clothes ready for the warmer weather and was sad to see that I was throwing more than half of them to one side because they didn't fit me anymore, at least not comfortably anyway. I looked at the sad pile of clothes that did still fit me, then looked at the gigantic pile that didn't, and I admit - I got upset, leading me to shed tears. It's no secret that I'm a comfort eater, resorting to food when I'm stressed, and my gosh I've had a lot going on over these last 12 months, I've had health issues that have left me extremely anxious, tired, stressed, miserable and they also stole every ounce of confidence I had left. I've had problems within my relationship with Gareth, I've had worries about Spud, I've been stressed because my house still isn't a home and I don't know when it will become one. Reaching for cake, chocolate and double servings of home cooked comfort food has took it's toll, a massive five stone toll. In two years I've gained five stone, that's the equivalent to two and a half stone a year - its disgusting and I only have myself to blame. When I pulled the scales out of their hiding place, and wiped away the dust, I really didn't expect such a big gain, I knew I'd put on a lot of weight, but I wasn't expecting that. At that moment, with tears dropping onto my feet and the scales, I knew I needed to take action, and it needed to be as soon as possible! I've always been big, I remember at school as a young child, I was always one of the biggest in the class year, then this stayed with me as I become a teenager, then an adult BUT never have I been this big. Never have I been jealous of other peoples clothes, because I've got so fat, I now have to shop at limited places that sell clothes in my size. Years ago, I done Weight Watchers and didn't do too bad on it, however I didn't have the greatest time with Weight Watchers, so I done my research and took myself along to my nearest Slimming World group on the Friday (12th May) morning. I was excited to start my new journey, but extremely anxious once I was outside the doors ready to go in. I plucked up the courage to walk through the doors, signed up, listened to the welcome talk and sat through my first meeting, taking tips from the members who'd been there a while. Armed with the newly found knowledge, my Slimming World pack and a few boxes of Slimming World treats that I brought for myself, I went home excited to start the diet. That Friday lunchtime, I had a meal booked from months ago, so I decided to start the diet the next day (Saturday 13th May), my first day didn't go bad at all, and with help from an online community I soon realised that I needed to eat more to be able to lose the weight - sounds strange doesn't it!? Eat MORE to LOSE weight!? It's how Slimming World works - by eating the right foods and more of it! On Friday just gone, it was time for my first weigh in. Arriving at the group this time was completely different, I was more excited then the week before because I wanted to see how I'd done, but I was also extremely nervous because I'd got the thought in my head that I'd put on weight - due to the amount I was eating during my first week (well technically six days!). 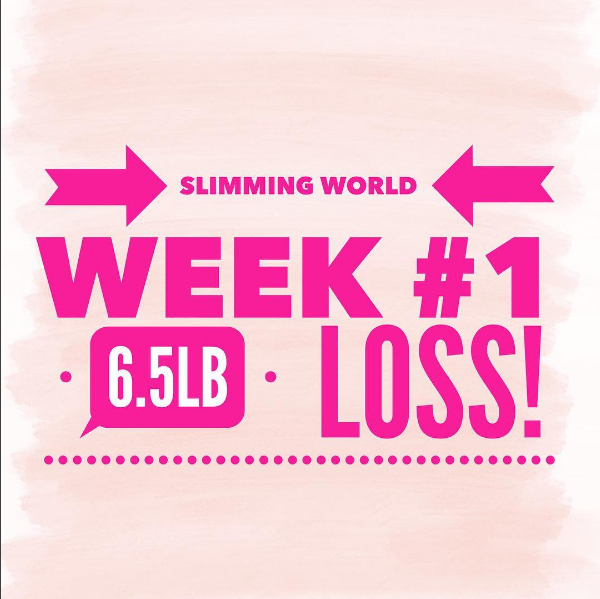 I needn't of worried as I lost a whopping 6.5lbs in my first week! On Friday, it will be my second weigh in, and I'm aiming for another 3lb off, that will take me to over half a stone loss. I'm putting this here on my blog, in the public domain to spur myself on. I figured by going public I would be an absolute fool if I quit or stopped or even reverted back to my old eating habits, because all of you would know and rightly so I'd be a laughing stock! I don't want this post not to carry on, I want to give weekly updates, and show myself/and you readers how I've done, I know it will spur me on, and give me more motivation and determination!